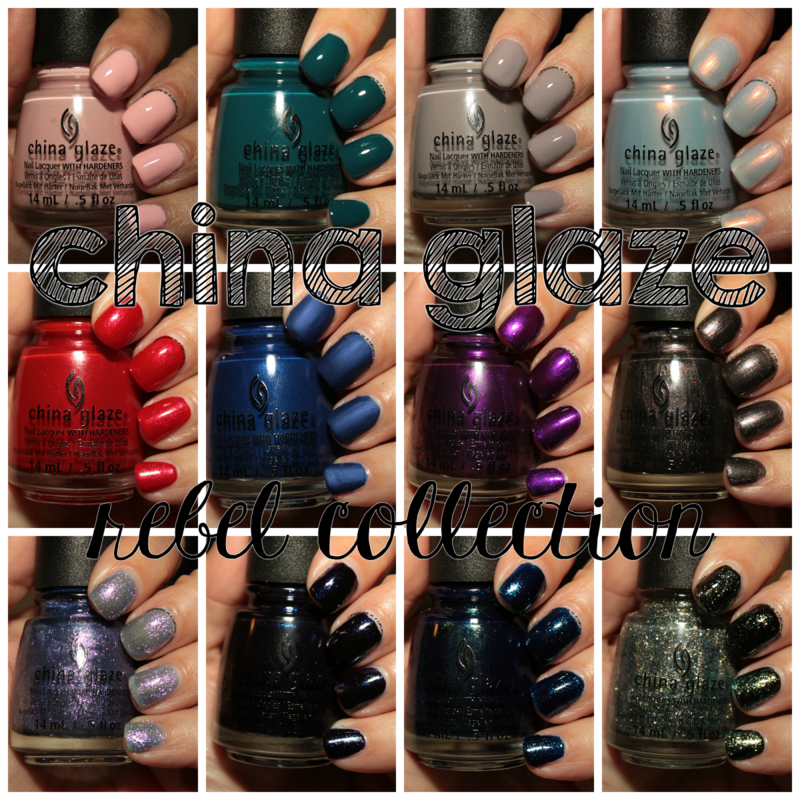 The China Glaze Rebel collection is a perfect mix of fun shades for fall and beyond! This 12-piece collection has a mix of cremes, glitters, mattes and everything in between. I've got my swatches and thoughts behind the cut... what were my favorites and not-so-favorites? I don't think you guys will believe me if I tell you that my favorite shade in this collection is a pink. I'm being serious! This is Fresh Prince-ss. It's not a shade I'd normally choose, but I wore this one for 4 days! It went on like butter, and 2 coats were perfect. The teal lover in me was all over this one - Jagged Little Teal. The name makes me giggle! I love this shade of this blue so much, it's one of my most favorites. The formula is a little on the thick side, so you have to be careful not to make it too globby This is 1 coat of this pretty polish! This polish, Dope Taupe, is so fresh looking! It's just such a pretty neutral taupe shade. You can see some pink/purple leanings. I used 2 coats for what's pictured, and I had no issues with the formula. It went on smooth. But from the looks of my swatch I bumped my pointer finger! ugh, I hate that. Oh my, oh my! Pearl Jammin' is so gorgeous! It's a pretty greyish-baby blue base packed with pinky shimmer with some gold thrown in. It just looks so amazing in the light. I had to use 3 coats for full coverage, but it doesn't end up looking too thick. It's just shiny! I wanted to love Combat Blue-ts. After all, it is a matte blue, and those are two of my favorite things! I found it clumpy and hard to deal with. You can see how my application just looks bad - it was hard to level and make smooth. Ah well, maybe this particular one just isn't for me! Now Purple Fiction on the other hand, this one is a keeper! It's a grape-y purple shade that has shimmer in red and blue. It was a bit on the thin side, but it's very easy to manage if you don't try to put it on too thick. I used 2 coats for what's pictured. I wanted to like Heroine Chic. The name makes me smile while simultaneously making me groan. It's the weirdest shade, too - a metallic kind of deep blackened brown base with red flakies and shimmer. I can honestly say I have nothing like it! But I found the formula hard to deal with. It was thin and hard to put on the nail, and I think it just looks odd. I might try putting this over a base color, and see what I think about it. I assumed Don't Mesh With Me would be able to me made opaque on it's own for me - I assumed wrong. 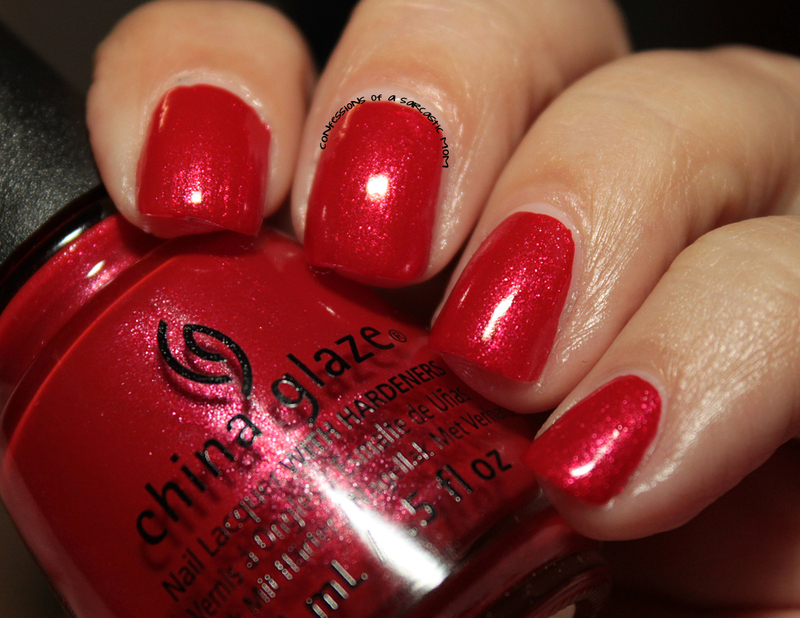 The glitter is very densely packed in the polish, but the clear base isn't thick enough. I should have put this over a base color. I do like the lavender and purple glitters - I just need to match them up with the right base. Teen Spirit, oh Teen Spirit. I had the hardest time getting this one to photograph. 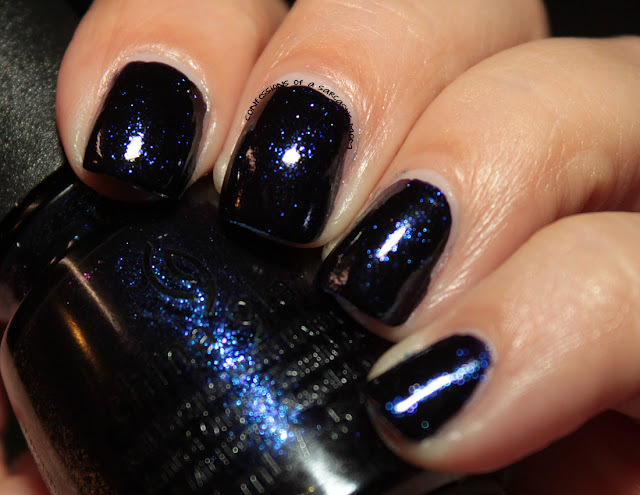 This is a deep inky blue shade packed with glitter. It just kept wanting to photograph black - but trust me, it color shifts! I see black, blue and purples all packed in there. The formula was pretty decent, and I didn't have any issues with application. Another name that makes me giggle is Blue-ya haha! 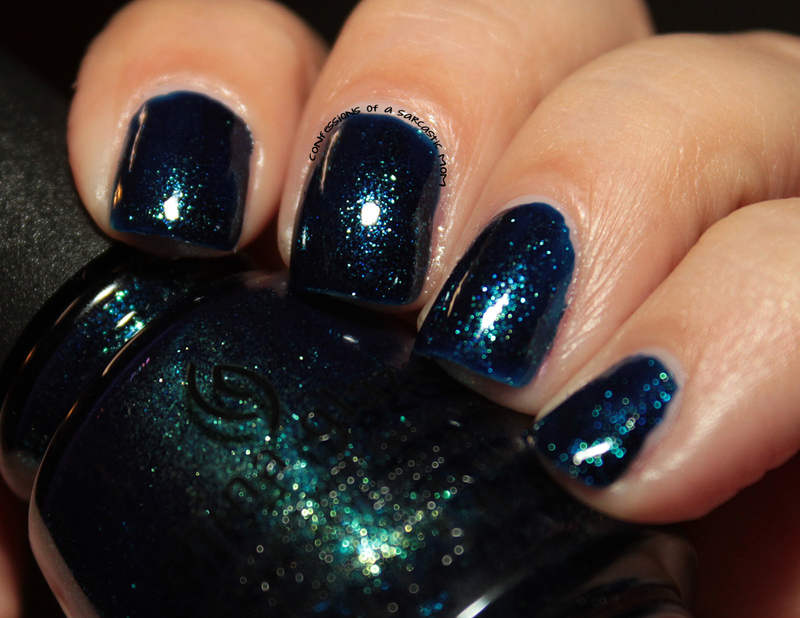 This blue is packed with shimmer! Such a pretty shade. The base is a little jellyish, so it needs a little extra finesse to maneuver if you're not careful. I'm going to be perfectly honest here. There's nothing holo about Holo At Ya Girl hahah It's a green-silver glitter that I could not get to capture green on camera. I don't see it. It might be because I chose a black polish as the base. Maybe I shouldn't have tried it with a base. I didn't want to fall into the trap like I did with the previous polish! haha It is very blingy. I used one coat over the black base. You can find these wherever China Glaze polishes are sold - I know they are out and on display at Sally's and Ulta. Price varies by vendor. You can get them online in various places, as well, such as 8ty8Beauty and Head2ToeBeauty.